After the previous days’ excitement today went very smooth and calm. A cloudy sky welcomed me in the morning, so again no shower. But an outdoor breakfast, with serious moka coffee and all kinds of tasty things I had with me. 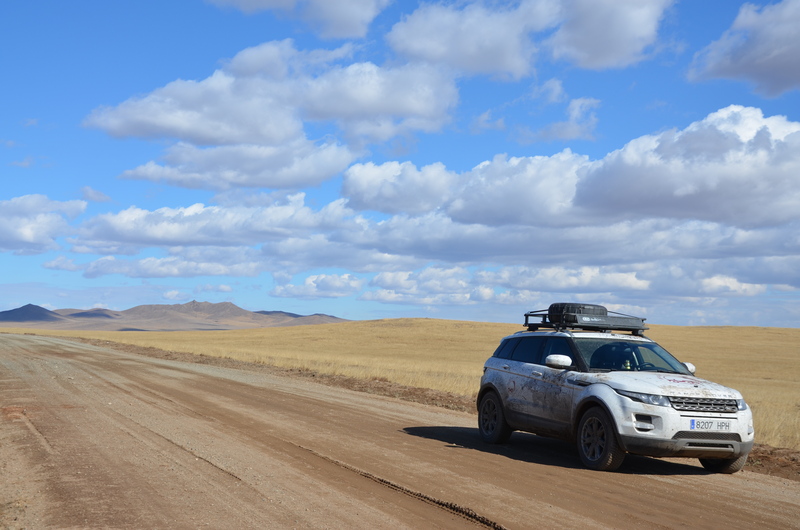 As usual, the car got packed quickly, and at 08:30 I drove down the hill where I had slept and was off on the dust track through the steppe. A couple of trucks crossed my way, two drivers stopped me, but we couldn’t communicate with no common language. The sun came out at around 11:00, and cheered the day up. The further I drove, the better the track got, and by noon I reached the proper tar road to the capital. 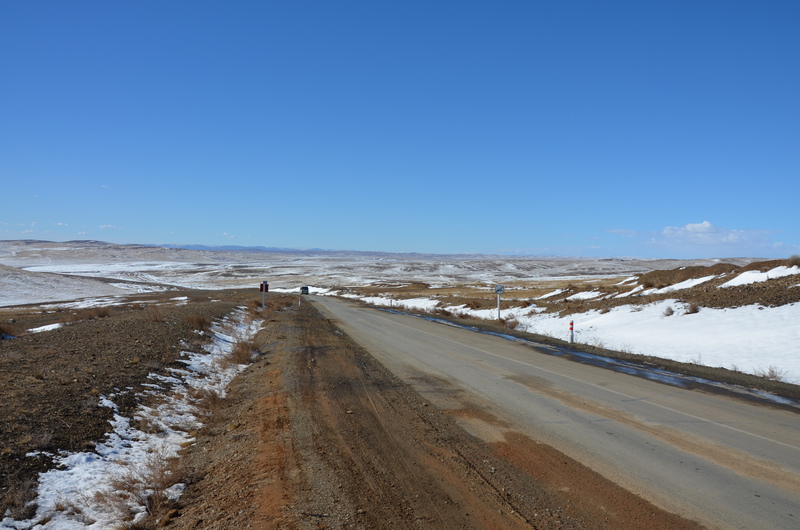 As I drove back towards Ulaan Baatar (UB), I noticed the mountains left and right where covered with first snow. I thought this eastern area maybe had worse weather then where I had been, but a couple of hours later I reached the place where I had left the main road three days ago, and it was also white, and no longer brown-yellow. The weather had gotten rougher, and I had found out the tracks through the steppe could change quickly into stretches of swamp, a big risk for me travelling alone. So as I kept driving, I weighted my options for the next days. Should I go see the Gobi desert, and risk more freezy nights (that take quite a toll on my energy level and my back and neck) and who knows what situations in the middle of nowhere? Ot should I take the main road across central Mongolia, that at least in part promised to be tarred, and would get me to the western border in 2-3 days? There was still Kazakhstan waiting for me, and I want to see Moscow at least. So spending too much time here might bring the risk of complicating things even further in a week or so. Back in UB, as I walked into the lobby of the hotel from a few days ago, I thought everybody must stare strangely at me. I hand’t washed for three days, needed a shave and change clothes. My fingers were black under the nails from the mud, I felt horrible. I got a room, brought my stuff up and disappeared for an hour in a big, hot bathtub. It has been the most pleasant bath in a long time. As it got dark, I went to buy food for the next days, and found an amazing supermarket in the state department store. They had everything, products I hadn’t seen in Mongolia in any other store. A vast choice of breads, cheese, fruit, vegetables, drinks, even good spanish red wine. Amazing, I filled up with everything I needed. Back at the hotel fatigue hit me, and I disappeared in the huge war bed thinking about the nights in the freezing tent ahead of me.